Crested Treeswift has beautiful blue-grey colored crest and orange ear covers. We went to Jessor Sloth Bear Sanctuary after the park was open for wildlife photography from 16 October 2016. We normally take track besides river. We saw crested serpent eagle, Changeable Hawk eagle and few other small birds. While I was busy clicking warbler, suddenly we saw large size swallow like bird flying over me. By observing closely, we saw that their wings are larger. Therefore, they are some kind of swift. While returning to parking area we spot their group roosting on tree. When I saw their crest, immediately know that it is Crested Treeswift. 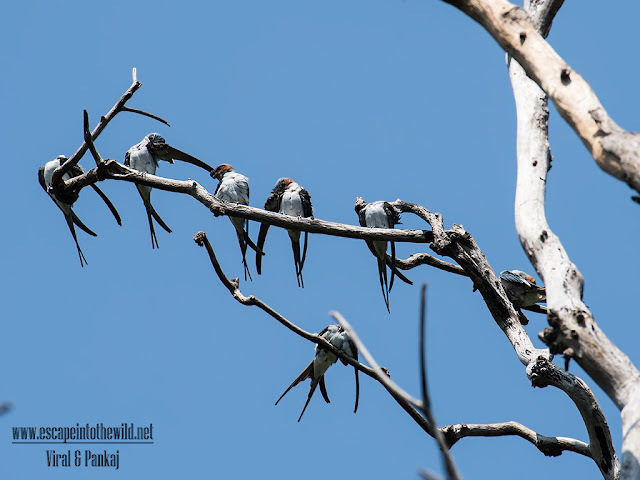 There are few records of Crested Treeswift from Gujarat but most possibly no photographic record from North Gujarat. It was our jackpot of the day and lifer too. After many days, we saw a new species in Gujarat. The crested treeswift is a common resident breeder from the Indian subcontinent. The crested treeswift is a large slender bird at 23 cm (9 in) length. This species is dove grey above and white below. The long swept-back wings are a darker grey above. 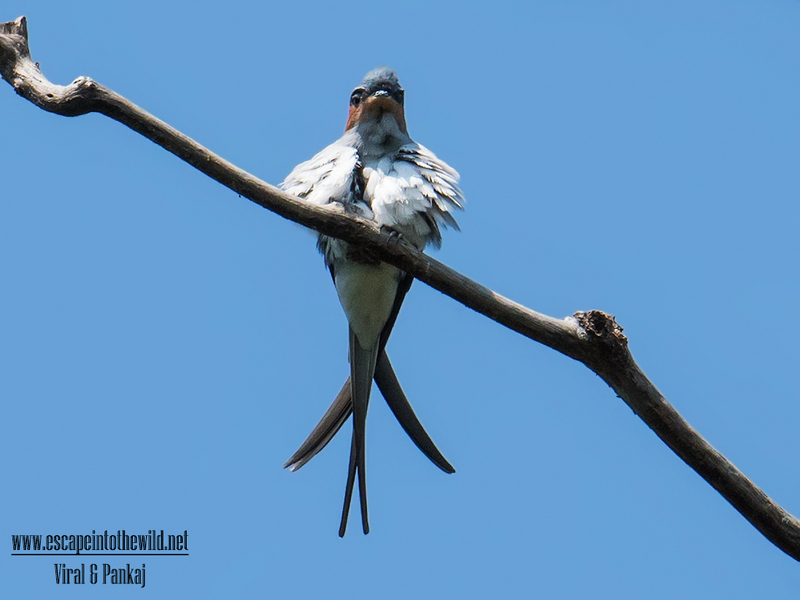 This treeswift has a crest and a long, deeply forked tail. The adult male has orange sides to its face. Young birds have a dark grey head and wings, but the rest of the soft plumage is much streakier than that of the adults. The crested treeswift feeds in the air, living on the insects it catches in its bill. It looks more like a swallow in flight than a swift, but is unrelated to that group. Unlike the true swifts, the treeswifts readily rest on high bare tree branches.